Earn 12 loyalty points, worth £0.60, when you buy this. A gentle yet highly effective exfoliator; lifts impurities, re-activates skin cells, draws in moisture, and lightens scars. 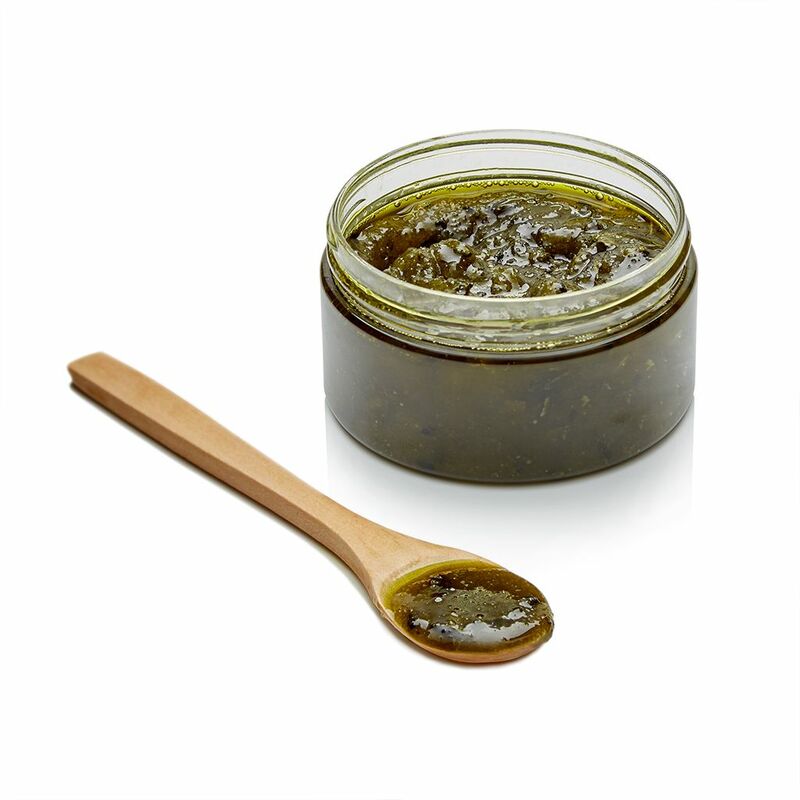 The Green Tea Face Scrub is safe to use bi-weekly for an undeniably smoother, hydrated and refreshed complexion. Green Tea: Anti-oxidant which flushes out toxins, heals blemishes and scars, delays the signs of aging and improves skin elasticity. Manuka Honey UMF 15+: Anti-bacterial, anti-inflammatory, soothes skin and heals blemishes, balances pH levels, also removes dead skin, making way for clearer pores! Take half a teaspoon of product, pat into the skin to allow the honey to melt, leave for 2-3 minutes then gently exfoliate in circular motions, rinse with warm water. For best results, use 2-3 times per week after the first or second cleanse. For very sensitive skin types, use once every 1-2 weeks. This has to be by far the best scrub I’ve used! After only two weeks, my skin texture has improved, the pesky under-skin bumps are clearing up and my skin tone looks more even. I will definitely be purschasing this again! I love useing this scrub in the shower as I like to use it all over. It smells absolutely amazing and I gets rid of all the dead flaky skin and leaves it feeling nourished and fresh. In love with this scrub, It leaves your skin feeling squeaky clean and really soft so you’re not left with that horrible dry tight skin feeling. I use it EVERYWHERE, on my 4th tub. Just love it! Love the smell of this scrub ! I have only tried it once so far but left my skin feeling fresh and soft . Can’t wait to see long term results. Growing older I'm now more concerned regarding ingredients used in beauty products and what it'll actually do for my skin, learning that your products only use natural ingredients and no chemicals, i was eager to try this product when gifted to me. I've only used this product once so far but it left my face feeling so smooth. I'm excited to continue using this to see real results! Looking forward to trying your other products! Will come back and leave a rating after more use. I only have positive things to say about this scrub. It gives instant results, my skin felt smooth and hydrated immediately. I loved it so much that I bought one for my sister who was converted after one use too! You have to try it to know. This is deifnately the best scrub I have ever used. I would 100% recommend it. This scrub left my skin feeling smooth and soft and I could see a difference after the first application. This product is amazing. Firstly, it smells amazing and I love products that have that fresh scent and this certainly does. From my very first use of this, I noticed that my skin was so smooth and radiant. Definitely worth purchasing and would recommend it to everyone.